At LifeBridge we are passionate about being a connected community. About doing life together and knowing each other and being known. Join us at our community events. 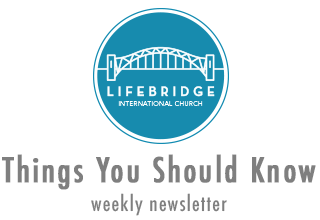 Every week we send out an informational email with all the things you need to know. To receive that email in your inbox, enter your information in Things You Should Know. Join us on the second Saturday of every month. A fun way to get and stay connected, plus, who doesn’t love a good brunch. Contact Jendi Korpi if you are interested or need more details about our next brunch. Get these future dates on your calendar!